of encouragement to all who read it. I have just realized that it's been for years since our last post on this blog. It's amazing to find that many people from around the world continue to view Aidan's blog. Our prayer is that many will be encouraged and blessed by Aidan's journey through life. One special person prompted me to revive the blog and thanks to him, I have decided to do so. Therefore this is just the beginning with lots more updates to come. One day when you're old enough to read this, I pray you will appreciate how much you are a blessing to Thatha's (Granpa's) and Patti's (Grandma's), Papa Jacob, Mummy Pam, Akka Allison & Abraham Annan, to Godma Evelyn and especially to me. You have been an inspiration for your fight and for the way you have brought families close together. You are truly a Godsend, Godson! You are most definitely fearfully and wonderfully made by God! I praise and thank Him for you.. and I dedicate this poem to you, as we journey together through life.. until we are face to face with our Maker..
the trials that lay ahead. but I will hold your hand." or when the storm would wane. tears, my faith began to grow. could Jesus' love shine through. At times I thought, "I can't go on." I'd hurt, and doubt, and cry. and then He cried, "Enough!" He raised His hand and said, "Be still!" I felt His presence strong. but only for my good. Today, Kerina Anne, a fifteen year old feisty teenager who lived life with a zest although suffering from Leukaemia, lost her fight and succumbed to the illness. She passed away early today. What has this got to do with Aidan? Well, we were so blessed to be surrounded by many who came to our aid in one way or another when Aidan was undergoing treatment, that we decided to give back by being there for those who were undergoing the same. 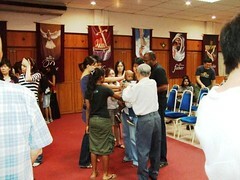 That is when we met Kerina who was undergoing Chemo for Acute Lymphoblastic Leukemia (ALL). She was a cheerful person who was always concerned about everyone else's wellbeing. 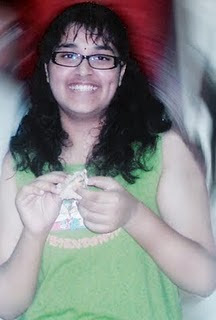 She had a beautiful spirit and it showed although she was under heavy medication. Why? We may ask. Why should such a young life be taken? We might not have all the answers but we can certainly be assured that our lives are in God's hands and there is definitely a reason and a purpose for everything that happens. My heart aches at the loss of this lovely child but I praise and thank God for her short but beautiful life and knowing that she has returned to her Maker. No more pain, no more suffering!! The initial part of the check up went like clock work. The nurses at Chemo Day Care drew Aidan's blood, ran the test and Whala!!!!! His Hemoglobin count was at an all time high of 15! Then we went over to the Doctor's clinic to see Aidan's trusted doctor. However there was no sign of him. Aidan started getting very restless after an hour of waiting and it was no better with me (Pam). We waited and waited and after 3 hours of waiting Aidan's doctor finally arrived. I was ready to huff and puff when he said that he had just come from the ward and had been consoling a family whose child had had a relapse and had a very slim chance of recovery. My heart felt like someone had reached in and squeezed it. We could easily have been in that situation. I realized then, more so than ever before how much we had to be thankful for….. Aidan's doctor himself mentioned to me that we should be so thankful that Aidan responded to treatment so well. The three hour wait became so minute an issue in comparison to what I had just heard. Everyday we watch Aidan grow and interact more and more with his siblings. He has also learnt to kick the ball really well too. What more could we ask God for??? God has indeed been merciful and kind to us!!!! Aidan's next check up is on 8th April 2010. Why no updates one might have asked? What's happened? Well, we have had another family drama. This time it was my (Pam) Mom. She developed something called diverticulitis at the end of September and I have had to once again be in and out of hospital. 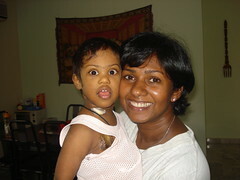 She finally had surgery on 3rd November '09 and spent 3 long weeks in hospital but is now well on the road to recovery. It is now December and I have just realised that I have spent 10 out of 12 months of this year in and out of hospitals. Jacob and I have decided to call this year a year of "Blessings in the midst of Trials" because although we've been through so much, God has been with us every step of the way. What more could one ask for? Aidan's monthly check ups have thankfully been going well. 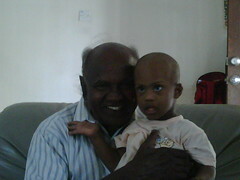 His blood counts are good and his doctor is very happy with his recovery. 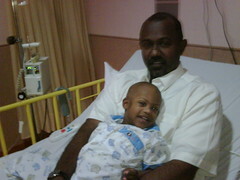 At his last check up on Saturday, 5th December '09, the doctor mentioned that his check ups will now be bimonthly. 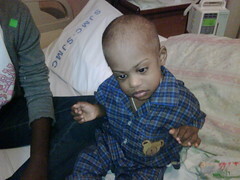 Looking back, Aidan went into treatment a baby and has emerged from it a big boy. It is such a joy to watch him walk, laugh and play. How much we take for granted? Aidan's illness has made so many things in life look so trivial. It certainly has changed our perspective of life. My daughter Allison who is 13, said the most beautiful thing to me a few days ago. She said that she was thankful that God gave Aidan to us. She said that it was because of Aidan that I am a homemaker today. She and Abraham my second child say that they never want me to work. They love having me at home and don't mind forgoing the luxuries of life that we could have if I too had a job. Aidan's illness has taught us to live each day to the fullest. It has made us realise how fragile life really is. It has also shown us that it is the trials that refine us and make us stronger. It has taken our FAITH to a different level. To all who have continued to pray for my darling Aidan, I say a HUGE Thank You! We would never have survived this journey on our own. I will continue to update you with the latest developments from time to time. And pictures too…….. This update is long overdue. We had a small technical problem with the blog but that's been rectified by Godpa. I(Pam) was blessed with a short holiday from 24th – 27th August. Jacob had a meeting in Singapore and I decided to tag along. It was a short break that we both so needed. Grandma and Grandpa looked after the brood while we were away. During the holiday, I had a lot of time to myself and every day I prayed that Aidan would not have to go through another blood transfusion on 28th August. (The day after we returned from our holiday). 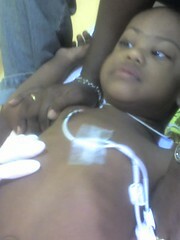 It is such an ordeal for us all to sit through a 4 hour transfusion and also not knowing if he will react badly to it. 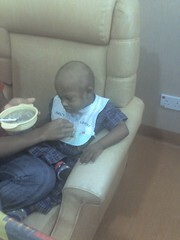 On the 28th August, as per the routine, we got to Chemo Day Care early in the morning. The nurses drew blood from Aidan (They now have to draw blood from his vein since the Chemo Port has been removed) and sent it for testing. The results came back and I couldn't believe my eyes. His haemoglobin reading was 13.3. The highest reading to date!!! I knew right then that God had answered my prayers. The nurses on the other hand were uncertain of the reading, so they sent another sample to the main lab for a second reading. The results were the same. When the doctor came, he said that the earlier result on 22nd August could have been a mistake as medically one's body cannot generate red blood cells that fast. I however know that I have a God whose ways defy science and logic. God had indeed answered my prayers. What a great and amazing God we have. Aidan will now have to go for monthly check ups. His next check up is on 23rd September. Jacob and I continue to trust God and know that Aidan is destined for great things. I welcome you to continue with us on this journey of seeing God's Master Plan at work in my fiery little one who stays true to his name. Aidan means Little Fire. & also please pray that he will begin to speak soon. 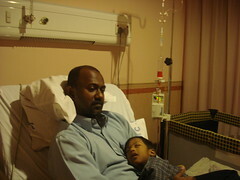 His next check-up is on 8th April 2010. 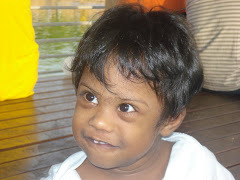 Aidan was diagnosed with Down's Syndrome at birth. We almost lost him at birth due to infection caused by meconium (he had passed motion in the womb)... but being the fighter that he is, he recovered and has been well since birth with the occasional flu here and there. 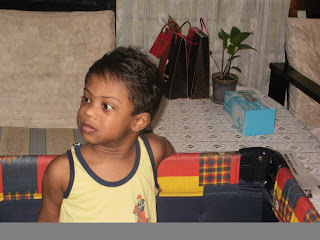 In early March of this year, Aidan had the flu and was warded as his chest was very congested. The doctor did a blood test and discovered that Aidan’s platelets were very low (thrombocytopenia). Although Aidan was discharged from hospital after 5 days, we kept going back weekly for blood tests only to find the platelets still low. After 3 weeks, we decided to get a second opinion and went to our trusted Pediatrician who did a blood test and then insisted that we see a Paediatric Oncologist at Subang Jaya Medical Center (SJMC). 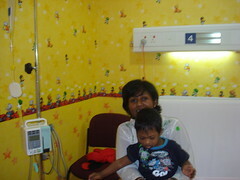 On 29th April 2009 Aidan was diagnosed with Leukemia – AML M7. Amazingly, God had already prepared Jacob and myself (Pam), Aidan’s parents, for this diagnosis simply through our morning devotion. 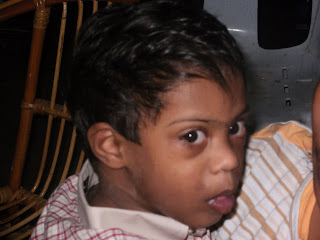 “Shall we indeed accept good from God, and shall we not accept adversity"
As soon as Aidan was diagnosed, we gave thanks to God that Aidan had been diagnosed at an early stage. Our God is a good God indeed. “I am with you always, even to the end of the age"
This gave us the assurance that God would be with us through this journey. Aidan and Papa one evening at the hospital - It is amazing how alike they look!! Grandpa comes to visit Aidan!